Quite frankly I had to see for myself what all the buzz was about. I had read about this place in a couple places, such as Wallpaper Magazine as a new style of funky boutique hotel. 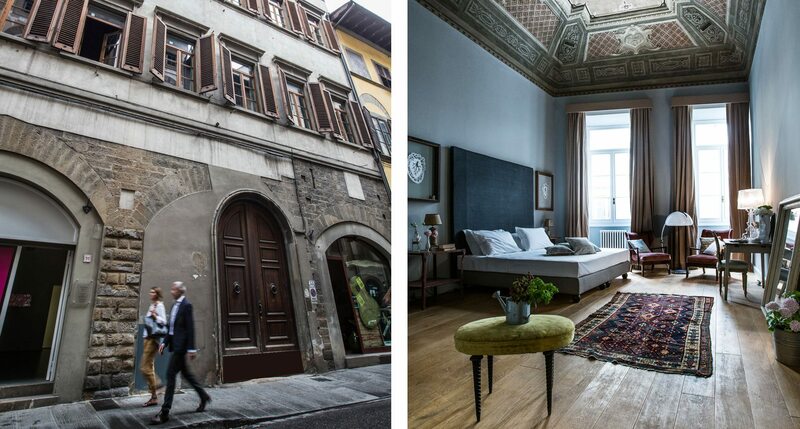 I pictured it as a cross between Novogratz chic, meets Ace hotel…and a dash of Florence fresco for good measure. upon arriving I realized I was somewhat close, but what can’t be summed up in a hybrid of styles is the overwhelming sense of casual elegance, mixed with the most gracious hospitality I had encountered in Italy. That is not to say I had not met many lovely people on most recent trip to Florence and Vanice, but my time at the Soprarno Suites was most definitely a highlight. It is situated in a lovely pocket of the southern quarter of Florence. Literally 5 minutes from Ponte Vechio, but far enough away from the touristy buzz that you feel removed from the noisy madness. One of the Owners, Betty Soldi, was kind enough to answer some of our questions. Any history you have about the building would be wonderful? The building dates back to the XIV century. It was home of the Velluti Family that during the centuries improved the property. A major refurbishment took place during in 1800 when the ceilings of the rooms facing Via Maggio were frescoed. Via Maggio is named after via Maggiore, because, once it was the main street in the Oltrarno which linked Florence south to Rome. All the richest florentine families wanted to have their main “palazzo” here to show their power and wealth. The area of Florence, what is the history. It’s not easy to summarize more than 200 years of history! Let’s jump to the Reinassance, in the XV century when Florence sparkles all over with its masters like Raffaello, Michelangelo,Leonardo, just to name only a few of them. The richness of Florence, due then to merchants and bankers attracted the best and helped to form the greatest! We like Al Tramvai in PIazza Tasso, Sant’Agostino in Via Sant’Agostino, Alla Vecchia Bettola in Viale Pratolini, Cammillo in Borgo san Jacopo. All typical restaurants based in our beloved southern quarter. Where can you get the best gelato in the vicinity? Go to La strega Nocciola, in via de’ Bardi, a few steps away from the Ponte Vecchio. Can you tell some of your favorite travel destinations or properties you have visited outside of Florence? Italy? We like Saturnia very much. it’s a thermal spot in the southern tuscan countryside. Due to its hot water you can visit it also when it’s cold. We like Bologna very much. It’s only a 35 minutes train trip away and it’s rich with restaurants, food shop and smiling warm people. Why do you love being a hotel proprietor? Because we can offer a different point of view on our beloved Florence, a more intimate one. And we hope that we could be able to enhance the experience of our guests.